Classic Movies is now on Pintrest! Though I've posted a few of my boards to Twitter, I haven't done much to spread the word about my favorite new place to geek out, so I thought I ought to write a post. I love that I can share so many images and be sure that the source will be properly credited. Classic Female Directors--You may be surprised by how many there are. 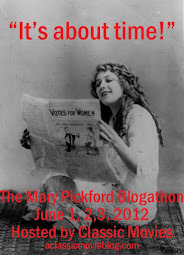 Mary Pickford--Inspired by the blogathon, and fed by the enduring obsession afterwards. Movie Biographies--Covers of some of the books I've reviewed. Movie Books--More covers. There's not much here yet, but I have plans to expand this board. Classic Movie Fiction--Covers of my favorite novels inspired by classic movies. This is a growing interest. Other Boards--Classic Couples (real and fictional), Classic Silents and Classic Hollywood Ladies. Drop by and take a look! If you've got a great Pintrest board, let me know. I may add these to future Classic Links posts. Hi, KC. I've been to Pinterest a few times. Looks cool, but I get overwhelmed- there is so much.